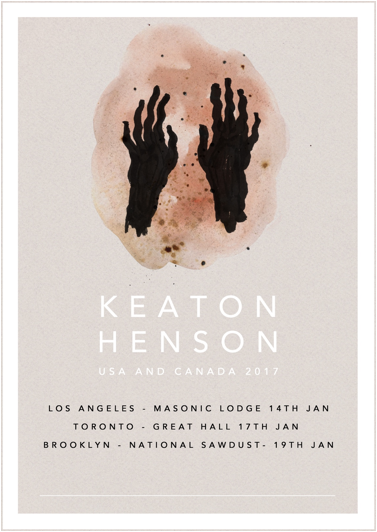 Keaton Henson today announced tour dates in New York, Los Angeles and Toronto. The intimate shows in January will be the first time he’s played in North American for years. Tickets are on sale this Friday November 18th. His latest record ‘Kindly Now’, which is out now on Play It Again Sam seems to both obscure and reveal, exploring the tension between things: from the traditional piano-led balladeering of Tom Waits and Randy Newman on one hand, to the experimental electronic sounds and tempestuous on the other; and from quiet, interior portraits to a busy, unbalanced landscape. ‘Kindly Now’ continues an extraordinary journey for Keaton Henson, who quietly released his limited edition, hand-made debut album ‘Dear…’ in 2012, before a surprise Zane Lowe play led to a flurry of investigation into Henson’s identity and whereabouts. Despite choosing not to perform or promote his record in a conventional manner, his heavier second album ‘Birthdays’ saw Keaton make an astonishing return to the live arena: from playing one-on-one for fans, to cinemas, museums and churches internationally. Whilst beginning to write songs for ‘Kindly Now’, Keaton pushed himself in two extreme directions: first, he taught himself the art of orchestration and arrangement, and surprise-released the critically acclaimed collection of bedroom-classical music, ‘Romantic Works’, on the same day as his immediately-sold-out date at London’s Meltdown Festival (at the request of James Lavelle). Then, Henson pushed the more electronic textures of some of his new songs into ‘Behaving’, his first album of wholly-electronic music (also staging a DIY, immersive production of Vivaldi’s Four Seasons for two-sold out nights at Oval Space, in association with The Barbican). On top of his work as a worldwide-exhibited visual artist, Keaton has recently released his first poetry collection (‘Idiot Verse’) and scored Balletboyz’ feature-length World-War-One epic ‘Young Men’ in conjunction with the BBC (originally performed at Sadler’s Wells). This has all – one way or another – fed into ‘Kindly Now’: an unheroic and unsettling examination of past loves, the role of the artist, and owning up to your own destruction. You can listen to his album "Kindly Now" on Spotify here.